The big news on T.V. for this week was the final show for David Letterman. I loaded my computer with this clip and took it to play for Dorris. 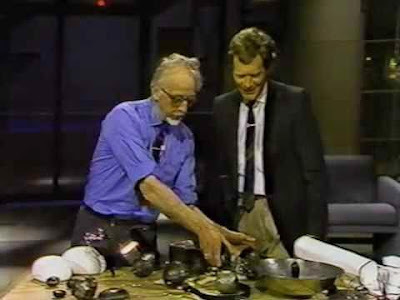 Marx was invited onto Letterman's show to explain how his stardust sculptures work. It is a great clip of the two of them joking and wondering over music found in unusual objects. I enjoy showing it to my undergrad students when talking about creativity. I manage to fool myself into thinking that this clip somehow makes me seem a bit cooler. Because her heart is slowing down, I usually find Dorris lying on her couch. On this day, I found her eating a sandwich while lying down. I could not convince her of the need to sit up while eating, but she sat up rather quickly when I told her I wanted to show her something about Marx. "Why haven't I seen this before?" "Where was I while this was going on?" "I can't believe I let this happen without me!" Even though my assurance does not last longer than about 30 seconds, I did manage to convince her that she was in New York with Marx and that she watched this from the backstage green room. One of the tough things about losing memories is the way the brain tries to make sense of a senseless world. This has been one of the fascinating things about walking this journey with Dorris. "Are we all aware that I was shot at in the bathroom?" "No, you were not shot at!" "I wasn't? Well, it sure makes a good story." As a student of thinking processes, both of these stories make me wonder: why do Dorris' responses make better sense to her brain than the reality that she might have forgotten something? This is a question to which every caregiver for a loved one with dementia would love to have an answer. Regardless of the physical health of our brains, we all live in a state of wanting to protect our imagined reality. It just does not seem possible that our brains could be wrong. Of course I am right, that is why I think this way. If what I was thinking were wrong, I would change my mind. Why don't my social media friends see things my way? The answer to my prayer must be the right thing for my life. If it were not, I would be able to see that. Why doesn't God see things my way? From before birth, our brain helps us to learn and over the years, we learn to trust it to show us reality. But, our brains are probably wrong as often as they are right. Trusting our brains is a mistake. This kind of trust requires humility. Not the secular understanding of humility where we degrade ourselves and let others dismiss us. That is not humility -- it is just humiliation. Humility means trusting that God is right, even when it does not seem like He is. Humility is putting God first because you rest in the assurance that He has taken care of all of our needs -- even our need to be right. God's teaching begins with my acceptance that my thinking is not His. God's teaching is truth, it is complete, and it is salvation.